Although generally known for being a dependable source of light and warmth to life on Earth, the Sun shows many signs of being variable. We have good reasons to keep track of this activity, not least because violent solar phenomena can pose risks to some widespread technology. For an overview of ongoing solar monitoring, the NOAA maintains a real-time Space Weather Dashboard, which among other indicators includes a count of sunspots. In visible light, sunspots appear as dark patches on the surface of the Sun (Figure 1) because they have lower temperatures than their surroundings, and they are directly linked to intense magnetic activity. The motivation behind today’s paper is that we could learn much more about the magnetic activity of other stars, if we could study their starspots in a similar way as sunspots. For a direct comparison with sunspots, it would be interesting to know the sizes and locations of spots on a distant sun-like star. But these properties are especially hard to measure because, for example, the spots would be expected to cover only a small fraction of the total stellar surface. However, there exists a peculiar exoplanetary system that allows such measurements to be made (and it is a favorite of astrobites authors). The exoplanet HAT-P-11 b is a Hot Neptune in orbit around a K4 dwarf star, which is about 80% as massive as the Sun and about 120 light-years distant. HAT-P-11 b has been discovered using the transit method, i.e. by detecting a small dip in the flux of the star, caused by the planet passing in front of it and blocking a small fraction of the stellar light (0.004%). 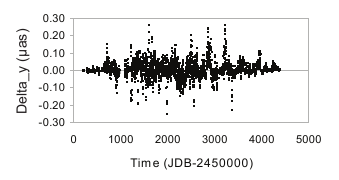 However, the observed Kepler light curve shows several bumps occurring during some of these transits (Figure 2, right panel). These anomalies are detections of starspots! When the planet passes over one, it blocks not a bright, but a dark patch of the star’s surface, so the star briefly appears a little brighter again. 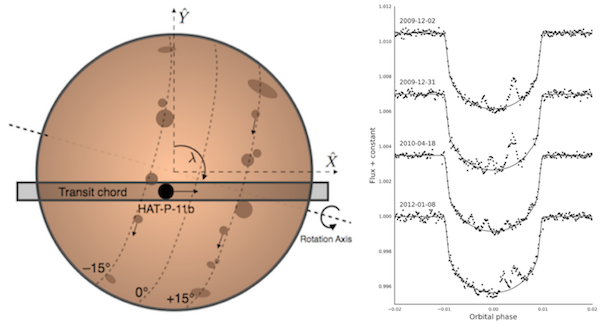 As HAT-P-11 b continues to revolve around its host star and the star itself rotates, the star’s flux measured at a certain time during a transit can be mapped unambiguously to a location on the star’s surface. This is because the planet’s orbit nearly runs over the poles of the star (Figure 2, left panel). It is this misalignment that makes it possible to estimate the positions and sizes of the starspots, by analyzing the exact timing and shape of the bumps in the light curve. In total, the authors detect 294 spots on HAT-P-11, during 138 of the 205 transits observed (over roughly 4 years). Detecting the same starspot multiple times is unlikely, due to the spots’ limited lifetimes. In a series of steps, the authors first model the re-occurring transit of the planet and systematically search for any significant flux anomalies. They then estimate additional parameters such as the stellar inclination and the spot contrast, and finally fit a detailed spot model to the light curves. Due to the geometry of the system and limited measurement precision, there can exist a few plausible spot configurations that describe a particular light curve equally well (Figure 3), but the full set of light curves holds exceptionally detailed information. The starspots of HAT-P-11 turn out to be similar to the Sun’s in several ways. They are distributed into two active strips spanning the star on either side of the equator (Figure 4), with slightly more spots appearing on the northern hemisphere. This distribution resembles that of sunspots at or around the maximum of the Sun’s 11-year activity cycle. 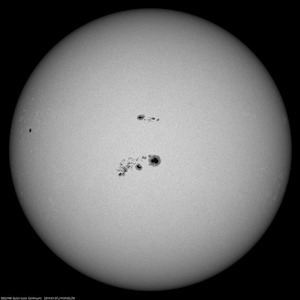 The observed range of typical spot sizes is also consistent with that of sunspots during a solar maximum. However, in other ways, the starspot activity of HAT-P-11 is more extreme. The spot coverage of HAT-P-11 is about 3%, which is 100 times greater than the Sun’s, because HAT-P-11’s spots are more numerous. A few of these spots also have remarkable sizes, larger than the biggest sunspot ever seen. The highly misaligned orbit of the transiting exoplanet HAT-P-11 b offers a unique opportunity to study starspots on its host star. It seems likely that the processes causing magnetic activity in the Sun, a G2 dwarf, operate similarly in this K4 dwarf, since both stars show such similar starspot activity. In the future, the authors are planning to observe additional transits of HAT-P-11 b from the ground, which would enable the further study of the progression of a stellar activity cycle, if HAT-P-11 does indeed follow a cycle like the Sun.